INK BRUSSELS 2019 (Semaine de l’Encre - 水墨周), to be held from May 6 to 12, combines conferences and workshops in the field of contemporary ink held in Auditoire Victor Bourgeois and Espace Architecture at the Faculté d’Architecture La Cambre-Horta ULB, place Flagey. This week of theoretical and practical events investigates the quest for abstraction in the practice of calligraphy and painting with a specific angle on Chinese writing, offering the opportunity of direct contacts between the public and invited artists and scholars. This travelling event functions as a collaborative enterprise between ink artists, curators and academic or cultural institutions in the host country. Paysage écrit/Ecriture peinte, a collective exhibition of 50 artists combining contemporary calligraphy and landscape painting, will be held in Espace Architecture from May 6 to 30, 2019. The show gathers artists from all origins who work with ink and paper as main media, (de)construct calligraphic geometries, engage in decoding and writing the landscape or experiment with language and gesture. A progressive itinerary looks at how each contemporary literati or letter artist departed from traditional artistic practices to explore the ways of abstraction. The exhibition unfolds in two parts, one devoted to nature and the other to culture, based on the basics of Chinese landscape painting: that a landscape is not to be seen or painted, but read or written. The versatility of nature, mountains and rivers allows Paysage écrit/Ecriture peinte to encompass a range of experiments dealing with the materiality, tools and gesture of writing, the limits of readability or perception, and geometries of ink and water. Four satellite locations partner with INK BRUSSELS 2019: the gallery and art residency ODRADEK with Contemporary Inks, a collective show curated by Simone Schuiten and Kiran Katara on ink and intercultural dialogue between four practitioners of ink on paper East and West, the art spaces Garage Cosmos and ArtWeCare, as well as the Royal Museums of Art and History with Lithic Impressions, a display focused on epigraphy and rubbings, a technique of replication from stone carvings to ink on paper. Lia Wei (coordination), Zhang Qiang (academic supervision), Kiran Katara (Faculté d’Architecture La Cambre Horta ULB), Simone Schuiten (ESA St-Luc and ODRADEK), Nathalie Vandeperre (Royal Museums of Art and History), Vanessa Frangville (EASt/ULB). Université Libre de Bruxelles (Faculté d’Architecture La Cambre Horta ULB, EASt/ULB, Institut Confucius ULB), Royal Museums Art & History (RMAH), Ecole Supérieure des Arts St-Luc, Institut Belge des Hautes Etudes Chinoises (IBHEC), ODRADEK, Garage Cosmos, European Lettering Institute (ELI). Ink Art Research Centre 愷뇽쳄牘論減欺宅彊카멕된桔씩櫓懃 (Sichuan Fine Arts Institute, Chongqing), Centre for Contemporary Visual History 뎠덜柬얾袈멕된桔씩櫓懃 (Taishan University, Tai’an), Renmin University of China (櫓벌훙췽댕欺옘뮴匡꺽溝). This collective exhibit gathers 50 artists who weave the ideas of writing, text, landscape, cartography and gesture, mostly in ink on paper or silk. The show at Espace Architecture takes advantages of the building’s dichotomic, entertwining structure, to construct a narrative based on twin itineraries - Paysage écrit and Ecriture peinte - respectively devoted to painting and writing. The two itineraries merge in a continuous progression that steps from one artist to the next, along a series of themes: from text to caracters, strokes, dots, textures and surfaces… to colour, maps, patterns, lines and the shapes of nature. Some degree of porosity is preserved between writing and painting, as the paths meet on an intermediary landing devoted to mapping. Learning how to master traditional writing tools is still the crucial part in becoming a calligrapher. In studying the past, students discover movements, gestures, techniques they can start experimenting with once a certain skill level has been obtained. At the European Lettering Institute, we encourage our more mature students in making their own writing tools, which will oblige them to discover new gestures, resulting in the reaction of new letterforms. We are happy to share part of this research and journey with the public. Four stations of demonstration by calligraphers from the European Lettering Institute introduce writing techniques to the public, with a fifth station where one is invited to construct one’s own tools for writing with balsa wood, metal and plastic. 9:45	Affordance of Ink. How is memory embedded and transformed in rapidly changing urban landscapes ? Following a site survey, this workshop proposes the collective construction of a monumental landscape, in ink on silk and paper. Mineral pigments and brushes will be available in situ. In addition to the tools produced during the previous workshop, techniques are to be invented by the participants. Invited calligraphers and landscape painters share their experience of the calligraphic brush, and invite the participants to formulate their own ‘texture strokes’, which compose the encyclopedic repertoire of landscape in Chinese culture. 11:15	From the ‘Music of Changes’ to the ‘Music of Ink-Ching’. An ambitious comparison? Participants: Jacob Alfred Garcia (workshop co-organiser, qin player and composer); Jiang Hanxuan (body and ink painting); Shao Yan (syringe writer); Silvio Ferragina (performance of musicalligraphy); Casimir Liberski (workshop co-organiser, pianist and composer). The interplay between ‘tradition/innovation’, and ‘composition/improvisation’ are central themes to be explored in this afternoon’s performance. This jam session will bring together musicians, performers and calligraphers to navigate and delve into these relationships. The search for commonalities that arise when performers of different backgrounds (music, theater, film or photography) interact with calligraphy will form a unifying objective as a method of cross-disciplinary collaboration. 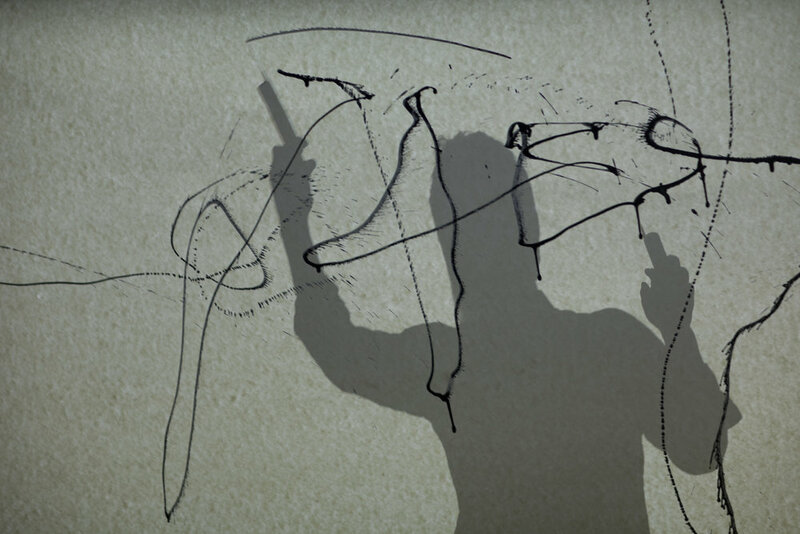 Likewise, calligraphers will be searching for echoes in their gestural and compositional practice as a means of establishing dialogical feedback within the performance. Jacob C. Alfred Garcia will provide a thread to the afternoon with his qin, with responses from Casimir Liberski. The calligraphers and performers will tune themselves on the on-going musical conversation. 9:00	Invited curators: Simone Schuiten (Ecole Supérieure des Arts St-Luc, ODRADEK), Kiran Katara (Faculté d’Architecture, La Cambre Horta, ULB); Rosalie Fabre (Garage Cosmos). 10:30	Invited artists: Brody Neuenschwander (Three calligraphic traditions: a few observations on Chinese, Latin and Arabic script); Jiang Hanxuan (Ink painting and distance); Zhu Pengfei (The sub-structure of language: calligraphy and landscape painting); etc. by Simone Schuiten (ESA St-Luc, ODRADEK) and the students and teachers in graphic design, illustration, calligraphy and Chinese painting from ESA St-Luc and IBHEC, in collaboration with the Centre for Contemporary Visual History, Taishan University.